Red Bumps. In North America, mosquito bites are mainly an annoyance. They cause itchy red skin bumps. Often, the bite looks like hives (either one large one or several small ones). When a mosquito bites, its secretions are injected into the skin. The red bumps are the body's reaction to this process. Suspect mosquito bites if there are bites on other parts of the body. Most bites occur on exposed parts such as face and arms. Swelling. Bites of the upper face can cause severe swelling around the eye. This can last for several days. With bites, the swelling can be pink as well as large (especially age 1-5 years). Disease. 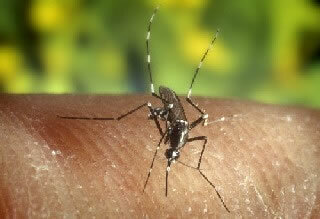 Rarely, the mosquito can carry a serious blood-borne disease. In the US and Canada, this is mainly West Nile Virus (WNV). In Africa and South America, they also carry malaria and yellow fever. The skin bumps are the body's reaction to the mosquito's saliva. While it's sucking blood, some of its secretions get mixed in. Most of the time, the bumps are less than ½ inch (12 mm) in size. In young children, they can be larger. To reduce the itching, use 1% hydrocortisone cream (such as Cortaid). No prescription is needed. Put it on 3 times a day until the itch is gone. If you don't have, use a baking soda paste until you can get some. If the bite is still itchy, try an allergy medicine (such as Benadryl). No prescription is needed. Sometimes it helps, especially in allergic children. If the bite has a scab and looks infected, use an antibiotic ointment. An example is Polysporin. No prescription is needed. Use 3 times per day. (Note: Usually infection caused by scratching bites with dirty fingers). Wash the sore and use the antibiotic ointment 3 times per day. Do this until healed. Avoid being outside when the bugs are most active. Mosquitoes are most active at dawn and dusk. Limit your child's outdoor play during these times. Caution: DEET can damage clothing made of man-made fibers. It can also damage plastics (eye glasses) and leather. DEET can be used on cotton clothing. Products that contain permethrin (such as Duranon) work well to repel mosquitos and ticks. Unlike DEET, these products are put on clothing instead of on the skin. Put it on shirt cuffs, pant cuffs, shoes and hats. Can also put it on mosquito nets and sleeping bags.